ProudNumbers produces management accounts from Sage 50 data. It is designed to save the accountant, or business manager, time. The ProudNumbers database enables fast access to figures, and drillable reports. From the Sage data the Trial Balance, Balance Sheet and Profit and Loss are reproduced for viewing purposes. The Charts of Accounts are imported, with restructuring enabled, so you can express the data as suits the business need. The Management Accounts are derived in the requested reporting interval. The data are presented as a drillable, printable spreadsheet type format. Departments can be viewed separately according to the Sage entered data. Proud Numbers provides a simple, robust, fast, cost effective solution for generating Management Accounts from Sage 50 data. 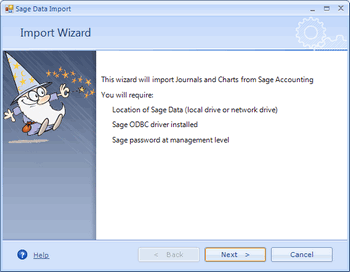 This software imports all the Charts of Accounts and Journals from Sage to the ProudNumbers (PN) database. Data import is via a Wizard function which leads you straight into creating a Management Report. Control reports; the Trial Balance, Profit and Loss and Balance Sheets (TB, P&L & BS), can be reviewed and printed. The Chart of Accounts can be reconfigured to present the amount, or style, of detail required. The original Charts are always kept. Management Account sheets are then generated for the time period and interval required, and tailored to individual needs. Management Account data can be interrogated in the spreadsheet to inspect contributing elements. This manual is designed to be a minimal text document. It is assumed the user will have some accounting knowledge or guidance. The software presents well known spreadsheet functions and its main aim is to give guidance for operation.